While the research may have only aimed to demonstrate what is possible for 3D printing of electronic devices, researchers at Princeton University have used 3D printing to create an entire contact lens with light-emitting diodes (LEDs) embedded into it. 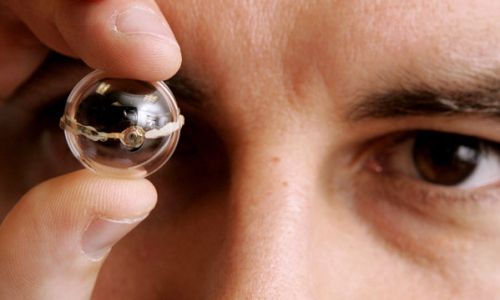 For the contact lens to actually work, it would require an external energy source, making it impractical as a real-world device. However, the real point for the Princeton team was to show that it’s possible to produce electronic devices into complex shapes using equally complex materials. The LED was made out of the somewhat exotic nanoparticles known as quantum dots. Quantum dots are a nanocrystal that have been fashioned out of semiconductor materials and possess distinct optoelectronic properties, most notably fluorescence, which makes them applicable in this case for the LEDs of the contact lens. This latest work builds on the Princeton team’s previous work in producing a bionic ear using 3D printing. That research was aimed at demonstrating how electronics and biological materials could be merged using 3D printing. In this latest research, which was published in the journal Nano Letters, the aim was to show that active electronics could be printed using diverse materials. To meet this challenge, the researchers built a hybrid 3D printer that is a combination of off-the-shelf parts and others a bit more exotic. While the researchers concede that the 3D printing of electronics in this way is not applicable for a lot of electronics manufacturing in which multiple copies need to be produced with a very high reliability, it may make sense for bespoke applications such as those needed for medical devices. In this case, the researchers scanned the lens and then fed the geometry into the printer so it that it could print an LED that conformed to the shape of the lens. The challenge for the researchers was how to bring together different materials that may be mechanically, chemically or thermally incompatible. “For example, it is not trivial to pattern a thin and uniform coating of nanoparticles and polymers without the involvement of conventional microfabrication techniques, yet the thickness and uniformity of the printed films are two of the critical parameters that determine the performance and yield of the printed active device,” said Yong Lin Kong, a researcher who worked on both the bionic ear and contact lens projects, in a press release. The above story is based on materials provided by IEEE Spectrum.